A character in the world Elonth. Featured image: Mar Flying by @elektronx, Mar Sticker by @emmathepaintdragon and Mar Reference made with PidgePudge’s Create-a-Dragon flash. Appearance: Being lightly-built with strong medium-sized wings, Mar is a strong flyer without a particular leaning to strength, endurance or agility. Mar’s scales are mostly dark blue. The scales on his hind legs and the underside of his tail a marginally lighter blue. 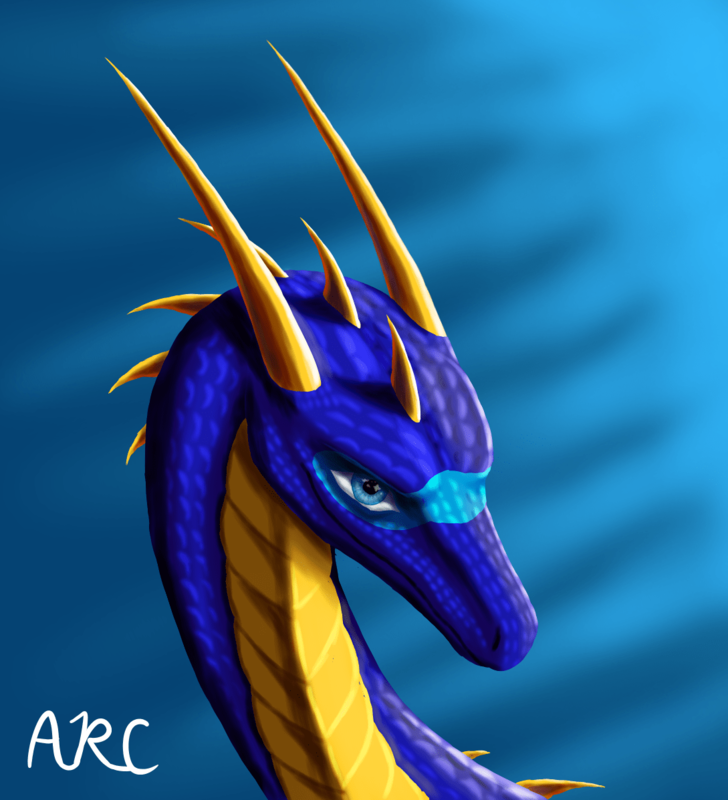 He also has a patch of bright blue scales around his eyes. His horns, spikes and chest plates are a golden-orange. Mar’s face is a friendly one, with the patch of bright scales lending him a goofy or playful look. Magic: Magic was not the main focus of his tertiary studies, but he has recently been attending the Raifal College and honing his skills. 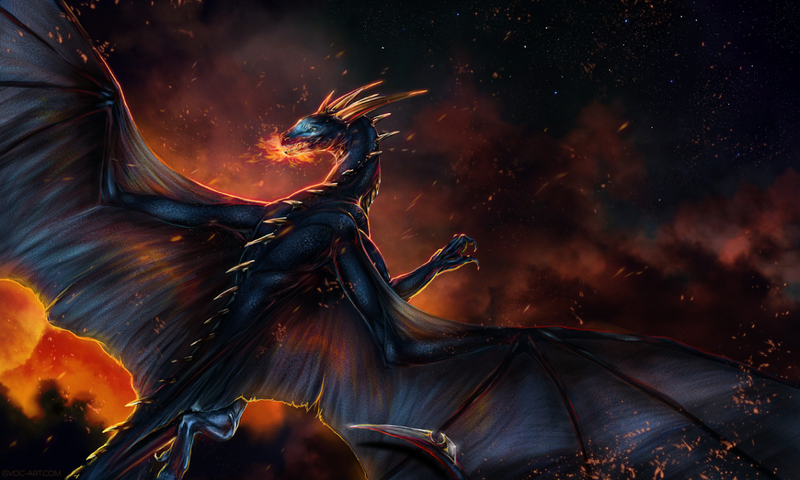 He is moderately skilled at general magic – definitely more so than your standard dragon, but nothing particularly amazing except for his advanced ability. His advanced ability allows him to create illusory worlds that appear entirely real to anyone trapped inside them. Personality: Doing his best to be a positive presence, Mar often appears sunny and, with his forgetfulness and occasional clumsiness added, carefree. In large groups he is usually pretty quiet, feeling more comfortable with smaller groups. With his friends or on his own, he can often act silly. People who know him well can tell that he cares a lot about his friends and family, wanting the best for them. He can often get lost in thought, his busy mind working through some problem or idea. He also has no qualm with alone time where he can sort through the many things going on in his head or work on projects in peace. Friends sometimes joke that he is addicted to information, wanting to learn all he can about how things work. College Scarf: The green scarf that Mar wears, emblazoned with a badge that depicts a waterfall cascading into the mists below, but lacking in additional stripes indicate he has recently achieved the 4th rank within the mage college. Crystals: When he left home to study in Tumenoos, his parents gifted him three artificial shiridan crystals each cut to be about 10cm in diameter. These valuable crystals are often used by mages to store magic energy or enchantments. When he plans to use them for magic, he will keep them near his chest. Otherwise, he’ll keep them in a vault at home, in his bags or – when he feels like showing off – floating in a row above his head. Bags: Most days he’ll have a large girdle around his chest upon which he attaches bags to carry items he’ll need for his daily tasks. Family: The Sterkvleuel family. Lyntarr (father – 187), Ilres (mother – 206), Ireka (sister – 34). Mar hatched in Tumensuid. He was raised alongside his younger sister (she hatched a few minutes after him), Ireka, and the van Schalk children – Josh and Amy. His father’s line has long been Tumenzarians, owning a large estate in Tumensuid. His father, Lyntarr, is an architect. Lyntarr enjoys using magic to accomplish feats of architecture that human architects wouldn’t manage. Mar’s mother is Ilres, an artist and designer who often works with Lyntarr on his projects. Her parents were Ebonscales that decided to live in Tumensuid after the Imaazar war. Both of Mar’s parents try to keep their works innovative and fresh, while not forgetting past successes and breakthroughs. The two married 83 years ago. At age 56, Lyntarr befriended a young human magician who had recently come from the far-away country of Deraten to work in Tumensuid (powered flight had not yet been invented by humans at this time). The human was Janiek van Schalk. When he discovered that Janiek was sending most of his income to his family – keeping only a bare minimum for rent and food – Lyntarr (with his parent’s permission) invited the human to come live on the Sterkvleuel family grounds. Together, the two built a human-sized house beside the main Sterkvleuel shelter. A few years later, Janiek married and his wife moved in with him. Every so often, Lyntarr flew the human to visit his parents – who were not allowed to move to Tumenzar. Lyntarr and Janiek remained lifelong friends. Lyntarr promised, beside Janiek’s deathbed, to look after the van Schalk family. He has acted as a sort of uncle-figure to Janiek’s descendants. While all the houses on the property have been demolished and rebuilt occasionally over the decades, there has since always been a branch of the van Schalk family living with the Sterkvleuels. One of Janiek’s great-grandchildren, Josh van Schalk was born the same year that Mar and Ireka hatched. Amy van Schalk was born two years later. It was discovered that Josh had a capability for magic, so he was even in the same class as Mar and Ireka in primary school. The four grew up together. Mar and Josh became almost inseparable. Ireka and Amy also spent plenty of time together. However, in later years Mar and Josh chose different lines of study. Josh had taken more of an interest in magic (as was common amongst humans – seeing as it was so rare to be gifted the ability) and left for Tumenoord, to study at the Mage College there. Mar had taken an interest in computers and left to Tumenoos to study computer science. For many years he has been studying and working with electronics, computers, computer systems, programming and the like. He has remained in contact with Josh and his parents, visiting and having visits from each fairly regularly. Josh’s wife, Carina, often joins them as well. In the most recent year of his life, he has slowly begun to have more frequent and vivid dreams of places he has never seen and people he has never met. One night he became trapped in one of these dreams for what felt like years, only to wake back in his house, almost completely drained of energy. When Mar tried to get it diagnosed, the doctor hypothesized that the dreams must have some relation to an advanced ability which was dormant in Mar until now. 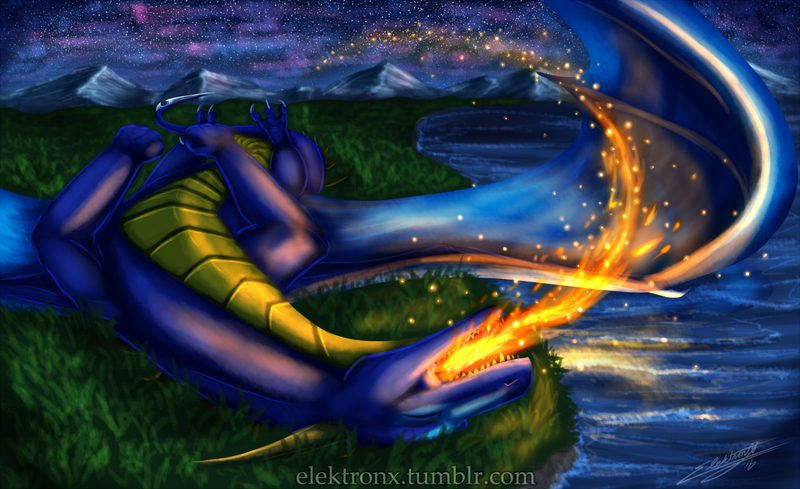 The dragoness then brought this to the attention of Tronesk, Elder of Tumenoos. Tronesk spoke to Mar, then contacted Irikshan – Elder of Tumenoord. Irikshan invited Mar to join the college to be taught in the ways of magic so he could learn to control his advanced ability. Mar accepted and has moved to a rented aerie in Tumenoord. Mar did not neglect his magical studies in school, thus the placement tests he took determined that he would be placed in mostly intermediate classes for his at the mage college. However, the exact nature of his advanced ability is still unknown to even the master mages. They hypothesise that it is a variation on illusions, and thus the elder Irikshan – a skilled illusionist – has chosen to tutor Mar.